Many of the manapé options will include miniature versions of popular traditional dishes, such as scaled down burgers or mini club sandwiches. The manapé menu can also sit alongside traditional canapés so that event organisers can cater for all appetites at corporate events. All of the new menus complement the ethos of the East Stand, which aims to get the industry to think differently about their events and challenge the norm. 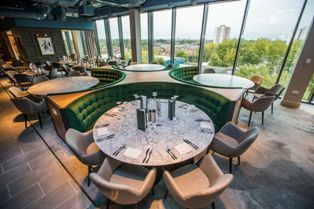 The multi-million pound redevelopment will offer six floors of creative event space that not only provide new-found match day hospitality options but also offer unexpected and dynamic settings that go far beyond a simple conference or banqueting space.